Almost two weeks after elections to 340 local government bodies were concluded, the major political parties remain locked in a tussle for supremacy, leaving the government in a state of flux with no clear ‘winner’ emerging at the time of writing. There was a clear winner though at the elections and that was the Sri Lanka Podujana Peramuna (SLPP). The newly formed party served as a vehicle for the dissident faction of the Sri Lanka Freedom Party (SLFP) led by former President Mahinda Rajapaksa, enabling him to test his popularity. Obtaining 45 per cent of the vote, it finished comfortably ahead of the SLFP and the United National Party (UNP). This had led to diverse demands from the three parties and it is these demands that President Maithripala Sirisena has had to give ear to. Ten days after intense lobbying and behind the scenes manoeuvring, the future direction of the government is yet to become crystal clear. The initial demand from the SLPP and former President Rajapaksa himself was that a general election should be called. This was on the basis that the ‘yahapaalanaya’ government had lost the mandate to govern. However, Rajapaksa would have known that this is not possible under the 19th Amendment to the Constitution which precludes dissolution of Parliament until February 2020, unless it is dissolved with two-thirds of the sitting members voting for dissolution- a prospect that wouldn’t become a reality in the current Parliament. The SLPP is also demanding that its parliamentary faction, the self-styled Joint Opposition (JO) be recognised as the largest opposition grouping in Parliament and be offered the Leader of the Opposition position. The thinking is that Rajapaksa would be very effective in that role, especially with presidential and general elections due in 2020, in January and August respectively. However this is also not possible simply because JO parliamentarians contested the August 2015 general election under the United Peoples’ Freedom Alliance (UPFA) banner- and the UPFA remains part and parcel of the government. For the JO to claim the Leader of the Opposition position, the UPFA should join the opposition ranks en masse- and that is also extremely unlikely. While the SLPP’s demands are aimed at creating political mischief in the aftermath of its election victory, the SLFP found itself in a more pressing predicament. The SLFP had finished the election in a distant third position, polling a mere 13 per cent of the vote. In some councils, they had polled less votes than the Janatha Vimukthi Peramuna (JVP). In such a situation, SLFP Members of Parliament are confronted with a harsh political reality: if the current trend continues they could well be out of the next Parliament, after general elections in August 2020. It is to counteract this possibility that they swung into action. There were also indications that most of them would not be welcomed with open arms by the SLPP. The SLPP had its own organisers at the electorate level who had toiled hard in the last two years- and they wouldn’t hand that to a parliamentarian returning to the fold after enjoying the perks of office in government. The initial demand from the SLFP was for the removal of Prime Minister Ranil Wickremesinghe. 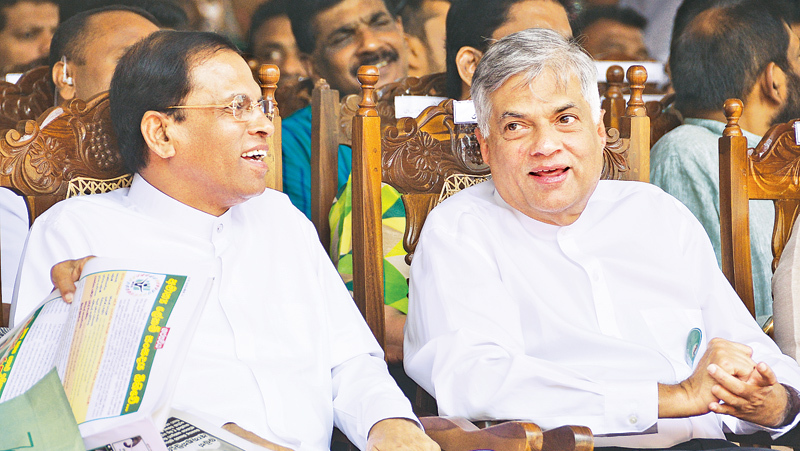 There were suggestions that the National Unity government could be resurrected under a different Prime Minister from the UNP. Speaker Karu Jayasuriya’s name was being bandied about although he had quite politely but equally firmly indicated that he would not be entertaining such a possibility. These moves drew howls of protest from the UNP. How dare the SLFP- which recorded an abysmal number of votes at the election and finished third- dictate terms to the UNP as to who should be Prime Minister, UNP parliamentarians asked. If anything, the SLFP’s demand made the UNPers close ranks alongside Prime Minister Wickremesinghe. By this time, some UNPers were demanding that the party go it alone, with the support of either the Tamil National Alliance (TNA) on an issue by issue basis or the support of selected SLFP stalwarts who had indicated a willingness to join the UNP-led government. It was then that the SLFP began its counter move. SLFP ministers made public pronouncements that it was seeking to install a ‘pure’ SLFP government. A signature campaign got underway to demonstrate support for a SLFP Prime Minister with Minister Nimal Siripala de Silva as the possible nominee. For its part, the SLPP announced that it would support a SLFP led government headed by de Silva, but would refrain from obtaining ministerial portfolios in such a government. Against such a backdrop, Prime Minister Ranil Wickremesinghe met the media last Friday afternoon. Usually not very media savvy, the Prime Minister emerged impressing journalists with his calm and relaxed demeanour. More importantly he argued his case convincingly: under the Constitution, Wikremesinghe said, he cannot be removed. The Constitution, in its recently introduced 19th Amendment, through Article 46(2), specifies the instances when a Prime Minister ceases to hold office. There does not appear to be a specific provision for the President to remove the Prime Minister other than when he loses the confidence of Parliament by losing a vote in the legislature. Prime Minister Wickemesinghe’s assertion was a setback to those SLFP ministers who were shuttling for negotiations between the mainstream SLFP and the SLPP leadership to fashion a compromise to try and forma SLFP-SLPP government. Legal experts took to the media, some suggesting that the President could, by dismissing the Cabinet, remove Wickremesinghe. Others supported Wickremesinghe’s view, arguing that there was no constitutional provision for the removal of the Prime Minister by the President. The SLFP has decided to explore this matter even further. Its parliamentarians have urged that the matter be referred by the President to the Supreme Court for a ruling. It was reported that, contrary to the previous reports of the SLFP quitting the government forthwith if Prime Minister Wickremesinghe didn’t resign, they had been requested by President Sirisena to stay in the government until the issue was resolved with a reference to the Supreme Court. At the time of writing, there was no confirmation that the matter had been formally referred to the Supreme Court. A debate in Parliament on Monday shed little light on new developments. Meanwhile, the major parties have entrenched themselves in what are now familiar positions: the UNP claiming that it is able to command the confidence of the House and form a stable government and the SLFP still exploring avenues to appoint its own Prime Minister. The SLPP meanwhile is happy to rest on its laurels for now. Clearly, it has set its sights not on short term ministerial portfolios but on the two major national elections in 2020. It feels it can return to power then and is no hurry to oust this government now. On the contrary, some of its leaders believe that entering government now would be detrimental to its electoral prospects in 2020. There is a high likelihood of a Cabinet reshuffle and a UNP led government- minus a few SLFP stalwarts- coming into being shortly, subject to clearance from the Supreme Court, if the matter is indeed referred to the Supreme Court. This is because the SLFP is, at present, unable to demonstrate a clear majority in Parliament. Had they been able to do so, they would have moved to oust the Prime Minister by now. What is clear is that the current state of uncertainty cannot continue for long. Whichever party emerges as the government, they will need to take a strong stand not only to ensure their own survival vis-à-vis the 2020 elections but also for the future stability and well-being of the nation. Elections to local government is just an indication how the central government is handling the affairs of the nation especially economy which reflects the cost of living and how society expect to durvive with riding costs.minorities still waiting for the society's relationship with each other how political groups are handling them to dociety,s satisfaction. The bribery corruption problems seem to be in this elections is not noted to be a case for concern although it is a problem remain not dolved. Violence not a thing that cannot be neglected. Now central government must play its role solving the national problems instead of making promises eith actions and vigour opus actions. Constitution making is in tardy state sooner action taken to solve it better for ation should keep calm improve the ailment before next general elections is important the country.